Bill Quern is a dance musician, tune-smith and dancer. His father filled the house with instruments for his 10 siblings to explore, so Bill developed into a multi-instrumentalist. Fiddle, banjo, melodeon, mandolin, and harmonica became his selection as an adult. He has a degree in Fine Arts from Mass College of Art where he studied performance, sculpture and instrument making. He plays for Contra and Square dances, and English Country dances all over the country. He teaches Morris dancing [is with the Kingsessing Morris Dancers] and Euro dancing [mainly Scandinavian and French], and plays for Philadelphia’s clogging group “Fiddlekicks”. 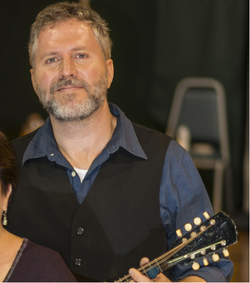 The bands he plays with include: Coracree [Celtic-American], Rumpus [Contra dance], Dancewiz [Contra dance], the Big Phat American K-lee Band [English Ceilidh], and Cabriole [French music]. Performances include: Old Songs Festival [Albany, NY], Catapult Dance Weekend [Atlanta, GA], Sidmouth Folk Festival in England, Enscaded Festival in Holland, has performed on Chinese television, the New England Folk Festival [MA], the Butterball Dance Festival [a.k.a. Contracopia][PA], FireAnt Festival in Austin, TX, Footfall Dance Festival in WV, and the Heritage Dance Festival in Philadelphia, and the Seattle Dance circuit.